The 98,000 square-foot pavilion includes a 300' x 150' show ring, seating for 3,900 and the Jefferson Federal Conference Room. The arena floor surface is versatile. Depending on the type of event, the floor can include loose dirt, hard-packed dirt, concrete, or carpet. Featuring a total of 408 horse stalls and a brand new 22,000 square-foot covered warm-up ring, the Ray and Barbara Equestrian Complex is host to some the region's premier horse and livestock events. Thanks to the generosity of Ray and Barbara Bible of Morristown, the Expo Center expanded its equestrian facilities in 2007 to accommodate larger horse shows and livestock exhibits. 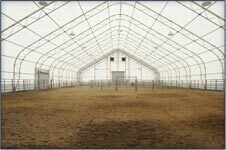 Prior to the expansion, the Expo Center's equestrian facilities included two 100-stall horse barns, an uncovered warm-up ring and a show ring. The recent expansion includes the addition of two new horse barns with 104 stalls each and an enclosed warm-up ring for horses that is connected to the Expo Center pavilion. 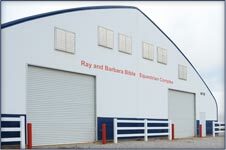 Walters State named the equestrian facility the Ray and Barbara Bible Equestrian Complex in 2008 in recognition of the Bibles' contribution and support. Two new 18,900 square-foot horse barns - 104 stalls each. Enclosed 22,000 square foot warm-up ring connected to Expo pavilion. Building materials: The two new barns and enclosed warm-up ring are covered with a heavyweight fabric called DuraWeave®. The covers are designed to provide exceptionally bright interiors by allowing natural light to penetrate through the fabric. The framework is constructed with ViperSteel®. An RV campground is conveniently located next to the Expo Center pavilion. The campground includes 32 paved parking spaces with water and electric hookups. The Expo Center includes lighted parking lots that can accommodate up to 1,800 vehicles.